Maca is an ancient crop species, believed to have been first cultivated some 2,000 years ago in the San Blas area of central Peru. Historically the crop was grown in the Puna grasslands of the Andean mountains on inhospitable terrain unsuitable for other forms of agriculture. 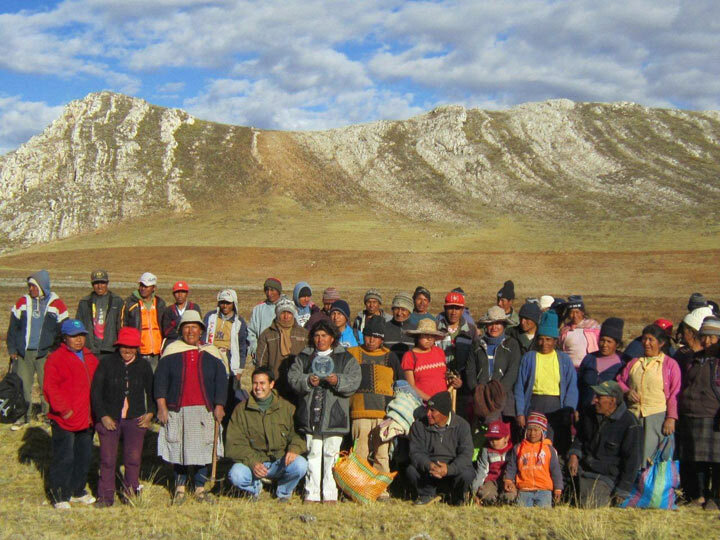 Maca today thrives in these hostile environments, only growing at altitudes above 3,500 metres on poor rocky soils where acidity may exceed pH5, and is able to withstand high winds and temperatures as low as -10°C. 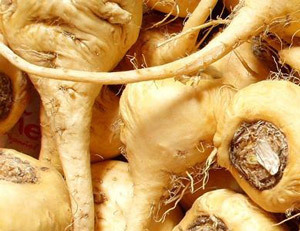 Maca is reputed to have natural insect-repellent properties and is sometimes grown alongside other highland crops such as bitter potatoes, as Andean farmers believe it protects the underground tubers from pests. 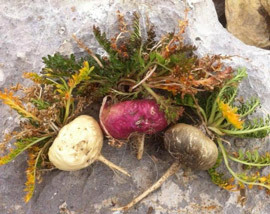 The maca plant grows in a flat rosette of frilly leaves with the edible part of the plant found below ground where it is formed by the taproot and the hypocotyl (the stem of a germinating seedling) which swell to form a harvestable root which is similar to a turnip in shape, and can be found in a variety of colours — yellow, cream, red, purple, blue, grey, black or green. In the Junнn region of Peru maca is consumed in large quantities as it provides a readily available and highly nutritious food source in areas where traditional agricultural practices struggle. It is eaten fresh with meat, cooked in underground ovens lined with hot stones called pachamancas, or dried before boiling in milk to make a porridge. Maca is also popularly made into in a sweet fermented drink called ‘maca chica’ or the dried root can be ground into maca flour for baking. Our maca is grown by a cooperative of local farmers at just above 4,000 metres, in the Carhuamayo province of the ‘Meseta del Bombom’ (Bombom plateau). The maca seed is sown in September at the start of the rainy season, in the early morning to avoid the high winds on the exposed mountain faces. After sowing, the seeds are buried using branches or sheep are released into the field to trample them into the ground. The maca plants grow throughout the winter and are ready to be harvested by the following May when the roots are about 5cm in diameter. The maca roots are dug out by hand using a small hoe called a cashu to avoid damaging them, then laid out under the sun for 10-15 days until they are dried. These dried maca roots can be stored for up to seven years, but ours are quickly transported to a local processing plant where they are carefully weighed, cleaned and the best quality roots selected for processing. These roots are washed, disinfected and cut into small 10mm segments, before being fully dehydrated at 45°C under humidity control. This dry maca root is then milled into a fine powder of 60 mesh specification (particles less than 0.251 mm diameter) and tested for microbes, before being packaged and shipped to the UK where we check the quality once more before distributing it to our stockists, where it can be found alongside other products in the Supernutrients range. Maca is said to increase energy levels, and in central Peru peasants eat up to 500 grammes of fresh maca daily, which they maintain ‘energises them enough in order to accomplish their farming activities as well as their husband activities’. It has a high mineral content, in particular iron (15mg/100g) which is needed to produce healthy blood cells able to carry oxygen around the body, and calcium (258mg/100g) which is essential for bone growth and especially important to women during the menopause, when bone density can decrease leading to osteoporosis. Maca is also believed to help stabilise and regulate hormone levels and is taken to alleviate symptoms of PMS and the menopause in women. 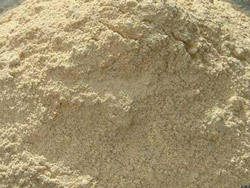 Powdered maca root contains high levels of protein — 10% of its dry weight — including 7 of the essential amino acids (those which the body cannot produce itself so must acquire through diet). The high amino acid content may account for maca’s reported endocrine and thyroid function enhancement. Maca also contains prostaglandins — messenger molecules which act like hormones to mediate physiological effects within cells, and plant sterols which may account for the reported aphrodisiac effects. Chemical analysis has also identified biologically active aromatic isothiocyanates, which may contribute to the potential fertility-enhancing effects of maca. Our organic maca powder is produced to the highest standards, following the same farming practices that have been used locally for generations. Maca has been eaten in Peru for thousands of years and its reputation and enduring popularity today speaks for itself. Try adding maca powder to smoothies or including it in baking recipes to benefit from the high natural mineral content of this “lost crop of the Incas”.